According to Rwanda’s Fifth National Report (5NR) to the Convention on Biological Diversity (CBD), and its State of the Environment and Outlook Report 2015, Rwanda’s tourism activities are concentrated in protected areas, particularly in its national parks. The tourism sector fetched USD $438 million in revenues in 2017, up from USD $404 million in the previous year. This best practice highlights the key policies and programs introduced by the government of Rwanda to harness its eco-tourism industry for socio-economic and ecological benefits, particularly for local communities living around protected areas and nature reserves. Tourism is a cross-cutting industry, capable of achieving several U.N. Sustainable Development Goals (SDGs), both by contributing to biodiversity conservation, and by developing a green economy and stimulating trade. Biodiversity conservation and poverty alleviation have been two major challenges for Rwanda. Rwanda’s tourism development, mostly nature-based, can be a key source of development, poverty alleviation and employment. Rwanda's key assets such as protected areas, national parks and nature reserves can be sustainably optimized to support eco-tourism efforts. Gorilla-watching is the most well-known tourism activity in Rwanda. In addition to conserving biodiversity, eco-tourism also helps in greening the economy through urban and rural employment, circulating cash in other sectors, and raising awareness on the importance of biodiversity conservation among communities and tourists to preserve natural and cultural heritage. Some of the most potential protected areas in Rwanda, which are capable of generating ecological, economic and financial benefits include: Volcanoes National Park, Akagera National park, Nyungwe National Park, among others. Target 1, by 2020, seeks to make the Rwandan people aware of the values of biodiversity and ecosystem services, and provide concrete steps for sustainable use thereof. Target 10, by 2020, seeks to prevent the extinction of threatened species, and improve their conservation status. Target 9, by 2020, seeks to protect at least 10.3 per cent of land area rich in biodiversity and ecosystem services. Target 13, by 2020, seeks to restore and safeguard all ecosystems that provide essential services to human well-being and contribute to health and livelihoods of local communities. Eco-tourism activities. Several improvements have been made, and new activities have been introduced, to enhance the eco-tourism experience in Rwanda. These include: birding, Nile trails, tracking chimpanzees, improvement of facilities and infrastructure, responsive customer care, and marketing Rwanda as an exciting tourism destination in international exhibitions and fairs. Some private tour operators also offer community-based tourism activities, such as stays with a local family, village walks, banana beer production or volunteering opportunities (Birdlife International, 2011). Additionally, the government has reintroduced extinct species such as rhinos and lions in national parks, in order to revitalize park resources. National Legislation and Policy: Over the years, Rwanda has undertaken several legislative and policy measures to create an environment suitable for a thriving sustainable eco-tourism industry. These include: Biodiversity Policy 2011, Biodiversity Law 2013, Rwanda Vision 2020 Development Strategy, Rwanda Wildlife Policy (2013), Rwanda Protected Areas Concessions Management Policy (2013), National Industrial Policy (2011), National Strategy for Climate Change and Low Carbon Development (2011), and Rwanda Tourism Policy (2009). The Protected Areas Concessions Management Policy, and the Rwanda Tourism Policy both seek to encourage private sector’s financial and technical investment in protected areas, in order to boost revenues from eco-tourism. Tourism concession policies in protected areas regulate the development and management of lodging facilities and other infrastructures owned by the private sectors, and promote, for example, the use of eco-friendly and locally made products. 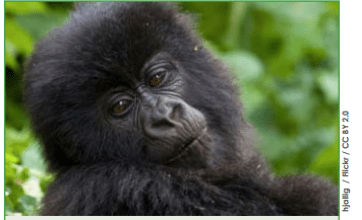 Greater Virunga Transboundary Collaboration (GVTC): GVTC brings together Rwanda, Uganda, and the DR Congo for the purpose of conservation and management of the mountain gorilla populations and their habitat. GVTC is a strategic management system for the Greater Virunga landscape. Through trans-boundary and collaborative mechanisms, GVTC addresses both conservation and socio-economic issues, in a landscape defined by ecosystems rather than administrative boundaries. Revenue-sharing Program: The government in several national parks, such as Nyungwe National Park and Volcanoes National Park, is allocating a certain percentage of the income generated from eco-tourism, to fund socio-economic activities which benefit local communities living around the national parks. Promoting Sustainable Livelihoods: Ecotourism is also providing sustainable livelihoods to local people, for example, instead of felling trees in the Nyungwe National Park, which is the traditional way to harvest honey from natural beehives, local people have been trained in income-generating beekeeping and have formed cooperatives, which generated 18,000,000 RWF in 2012 (RoR, 2014a). Additionally, community-based tourism policies and plans provide guidelines for integrating communities into conservation activities, while simultaneously benefiting the tourism sector (for example, Gorilla Guardians in Volcanoes National Park, engaging local communities in managing the Kitabi eco-center in Nyungwe National Park). Resource Mobilization. Through a grant by the Howard Buffett Foundation, Rwanda Development Board (RDB) invested more than USD $3 million in conservation efforts within Rwanda’s National Parks which resulted in: 263 law enforcement rangers trained; 16 new patrol posts constructed; Anti-Poaching helicopter & Unit K9 established; and Eastern Black Rhinoceros re-introduced in Akagera National Park (RDB Annual Report 2017). Tourism is a cross-cutting industry, capable of achieving the U.N. Sustainable Development Goals (SDGs), both by contributing to biodiversity conservation, and by developing a green economy and stimulating trade. Rwanda's eco-tourism industry accounts for a significant portion of foreign revenue. Eco-tourism is very important for Rwanda's macro-economic stability and prospects of economic growth. There has been a significant local investment in tourism, totaling approximately $700 million in a ten-year period (MINICOM, 2009). In 2010-11, the number of employees in the tourism sector was estimated at 23,000, with many more sectors indirectly benefiting from tourism, such as restaurants, transportation services and retail trade (NISR, 2012). The latest 2018 mountain gorilla census of the transboundary Virunga Massif region, released by the authorities in the Democratic Republic of Congo, the Republic of Rwanda and the Republic of Uganda, has recorded 604 mountain gorillas (Gorilla beringei beringei) in the region. The increase in mountain gorillas inhabiting the transboundary Virunga Massif region has been attributed to effective conservation policies, strategies, regulated tourism, effective law enforcement, community engagement, and transboundary collaboration among governments and civil society (UN Environment Press Release 2018).